Yup. Bottled water is a really controversial thing. We know. But, the reality is people are still going to be drinking it (out of choice or necessity). That's why we're doing things differently! We're committed to being as eco-friendly as possible. The money we're raising goes toward protecting our environment and solving water-related problems – including ones caused by traditional bottled water companies. 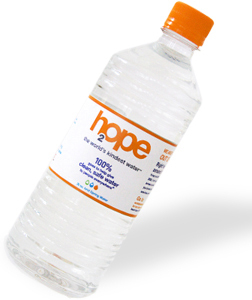 Remember, these problems are the whole reason that h2ope The World's Kindest Water™ products exist! We will constantly update the sustainability of our bottles as technology catches up with our environmental desires… and who knows, maybe we'll influence the “big 3” (Pepsi, Coke, and Nestle Waters) to do the same! Fewer than 10% of Americans recycle. Yikes! Please help us change that number. Until the day comes that there is no need for bottled water at all, we are committed to using the most environmentally safe packaging available. We will constantly update the sustainability of our bottle as technology caches up with our environmental desires... and who knows, maybe we’ll influence the big guys to do the same.